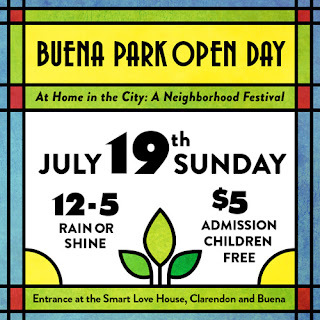 Buena Park Open Day (BPOD) celebrates its third-annual neighborhood festival on Sunday, July 19 from noon to 5:00 p.m. at Clarendon and Buena. This year there are two new developments at BPOD. The first week in July saw the graduation of ten Docents, specially trained to give architecture tours of the Maher houses on Hutchinson Street. They worked through the winter and our very wet spring, learning all about Prairie style architecture, leaded glass and European and American architecture trends around the turn of the century. They are well educated and ready to share their knowledge and enthusiasm with BPOD attendees. The second development is The Bazaar on Buena, an arts and crafts and gently used treasures market place. Vendors range from ceramics, sterling silver jewelry, art prints, handcrafted wood items, original water colors, hand-knit dog sweaters, home made American Girl outfits and vintage jewelry to vintage refurbished furniture, books, DVDs and other used household treasures. Find them all just off Clarendon in the parking lot of the Smart Love house at Buena. 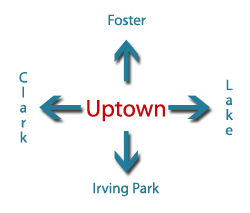 The festival’s hub will be at the Smart Love House which is a neighborhood landmark that is located at Clarendon and Buena. Attendees can sign up for architectural tours, participate in family friendly activities, shop the new Bazaar on Buena, listen to live music or take a break at the pop-up café. This year’s Buena Park Open Day is themed “At Home in the City,” because the festival highlights why the neighborhood motto is “Good Living by the Lake.” Buena Park has long been considered to be a hidden gem at the south end of Uptown that borders. It boasts a vibrant and diverse cultural scene, architectural masterpieces, a laid-back vibe and that all-important X factor, longtime residents who are eager to share their corner of the city with the rest of Chicago. Thirty-minute sidewalk tours of the architect George Maher’s historic homes on Hutchison St. focus on the exteriors of this Prairie School architect who some consider to be as influential in the Midwest as Frank Lloyd Wright. Tours are every half-hour between 12:30 p.m. and 4p.m. Open house and tours of St. Mary of the Lake Church, 4200 N. Sheridan Rd. display this nearly 100-year-old church that was designed by Chicagoan Henry J. Schlacks in the Italian Renaissance style and showcases Carrera marble work from the same quarries that were used by Michelangelo. The two tours are at 2:30 p.m. and 3:30 p.m. The Pop-up Café is fueled by a bevy of fabulous food trucks, including Cupcakes for Courage, Husky Hogs and Meatloaf-a-Go-Go which will be located at Clarendon and Hutchinson Streets. There will be family fun all day long: exotic animals, bouncy house, games, sing-alongs, face painting, police horses, a visit from a fire engine, story time with the Alderman, hula hoop fiesta and more. There will be exhibits and activities that showcase neighborhood organizations and businesses, including the always-popular Gingko Gardens which is an organic community garden with a mission to provide fresh produce to Uptown organizations that serve low-income and homeless people. The Buena Park Open Day entrance is located at the corner of Clarendon and Buena at the Smart Love House. A $5 suggested donation includes a program. Children that are under age 12 are free. 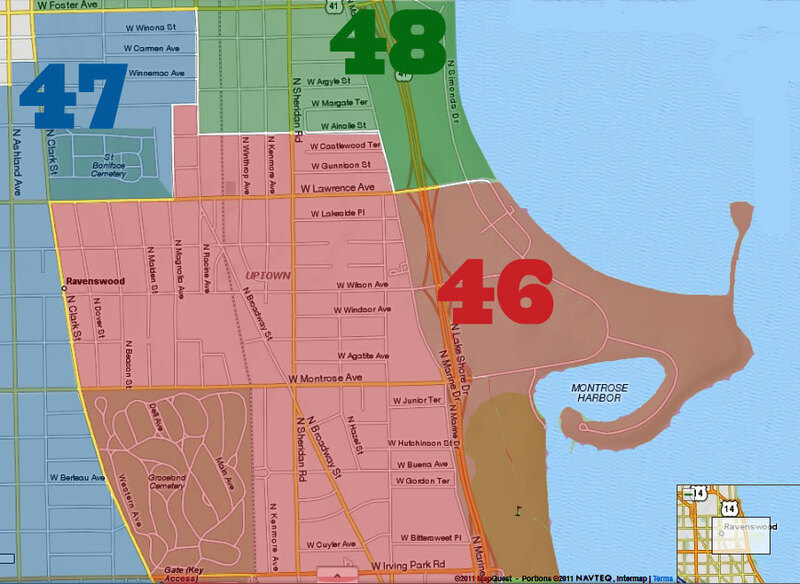 For public transportation: take the #36, 151 or 146 bus to Buena (4200 north between Irving Park and Montrose). By L take the Red Line to the Sheridan stop which is just 4 short blocks away from the festival entrance at Buena and Clarendon. The third annual Buena Park Open Day has been generously funded by neighborhood businesses: Thorek Hospital, SSA34, Reside Living and the Chicago Cubs.